Your cast iron metal pan leaves the factory with pinholes, leading to a slew of complaints from your customers. What happened? How could you have prevented this from happening? Foundry production is a complex multi-step process. The technical level of each process varies greatly. Skills of the operator, quality management and equipment can all affect the final quality of the casting. 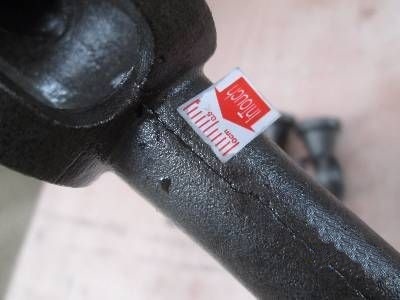 The key to preventing product defects in your casted products is to set clear expectations and tolerances for quality issues with your supplier. But before you can do that, you need to have a clear understanding of the different types of casting defects and their causes. Only then can you prevent casting defects and avoid sending defective products to your customers. Pinholes, also sometimes referred to as porosities, are very tiny holes (about 2 mm) usually found in the cope (upper) part of the mold, in poorly vented pockets. They usually appear in large numbers together, either at the surface or just below the surface of the casting. They are always visible to the naked eye and don’t require equipment to identify. 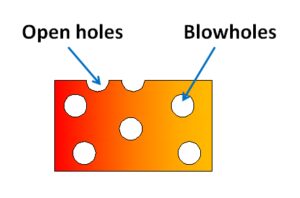 Blowholes, or simply blows, are larger cavities than pinholes. A subsurface blowhole appears on the inside of a cast and usually isn’t visible until after machining.Subsurface blowholes can be difficult to detect before machining, requiring harmonic, ultrasonic, magnetic or x-ray analysis. These blowholes appear on the surface of the cast and are easier to detect than subsurface blowholes. There are several causes of cavity defects. How can you prevent gas porosity? Scars are shallow blows that appear on a flat surface, while blisters are scars covered with a thin layer of metal. Shrinkage occurs because metals are less dense as a liquid than a solid. A shrinkage cavity is a depression in a casting which occurs during the solidification process. Shrinkage porosity appears with angular edges, compared to the round surfaces of gas porosity. Cavities might also be paired with dendritic fractures or cracks. Large shrinkage cavities can undermine the integrity of the casting and may cause it to eventually break under stress. Shrinkage can result in two types of casting defects. These are open to the atmosphere. Air compensated as the shrinkage cavity forms. Pipes are open shrinkage defects that form at the surface and burrow into the casting. 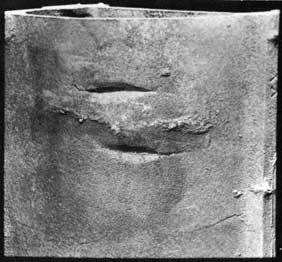 Caved surfaces are shallow, open shrinkage defects that form across the surface of the casting. 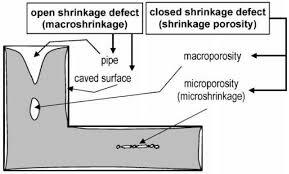 Also known as shrinkage porosity, closed shrinkage defects form within the casting. Macro shrinkage can be viewed with the naked eye, but micro shrinkage cannot. Closed shrinkage defects usually appear at the top of hot spots, or isolated pools of hot liquid. Alloys always shrink when changing from molten to solid. This is because the density of a casting alloy in the molten state is lower than that in the solid state. You should expect some shrinkage during solidification. Factor a shrinkage allowance into the pattern design before casting. Mold material casting defects are related to the mold material, which is most commonly sand. 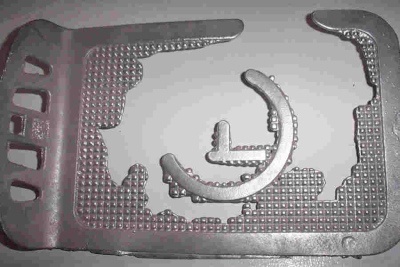 You and your supplier can typically address these casting defects and causes by modifying the mold. Cuts and washes are areas of excess metal. These appear when the molten metal erodes the molding sand. A cut appears as a low projection along the surface of the drag face, decreasing in height as it extends from one side of the casting to the other. Cuts and washes can be caused by molten metal flowing at a high velocity, causing too much metal to flow through the gate. Fusion occurs when sand grains fuse with molten metal. It appears as a thin crust with a brittle, glassy appearance firmly adhered to the casting. Refractoriness is the ability of the molding material to resist the temperature of the liquid so it doesn’t fuse with the metal. Silica sand has the highest refractoriness. Improving the refractoriness of the molding material and/or reducing the pouring temperature of the molten metal will help prevent fusion. Run out is when liquid metal leaks out of the mold, leading to an incomplete or missing casting. A faulty mold or flask is responsible for run out. To prevent this casting defect, design the casting mold with precision. Inspect and replace any defective molds before casting. High temperatures can lead to excess wear and tear of the mold. Use quality raw materials for your mold that can resist high temperatures. Swells are an enlargement of the casting. Swells typically take on the shape of a slight, smooth bulge on the vertical face of castings. Swell is usually caused by improper or soft ramming of the mold or a low strength mold. Molds should be built to withstand liquid metal pressure. Otherwise, the mold wall may give way or move back, causing swelling. Using a strong, properly rammed mold prevents swells. Drops occur when pieces of sand fall into metal casting when it’s still liquid. 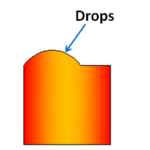 Drops appear as an irregularly shaped projection on the cope (top) surface of a casting. Rat tails, or veins, appear as an irregular line or crack on the casting, when the surface of the molding sand buckles up. Rat tails usually occur on the surface of the mold bottom, an area covered with molten material. Buckles are a more severe form of rat tails. Poor expansion properties of the sand: Add combustible additives to sand. 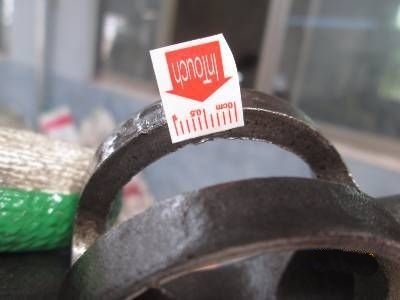 A hot pouring temperature: Reduce pouring temperature of metal. Poor mold design: Large and flat sections are more prone to rat tails. The mold also should not be too hard, as it must allow for proper expansion. Metal penetration occurs when liquid metal penetrates gaps in the molding sand. The penetration is visible to the naked eye as a rough and uneven surface finish of the casting. Prevent metal penetration by fixing these areas. Use high strength, small grain size, low permeability and hard ramming of sand. Ensure a protective barrier against metal penetration by coating the surface of molds with a mold wash.
You can typically remove metal penetration by grinding down the rough surface of the casting. 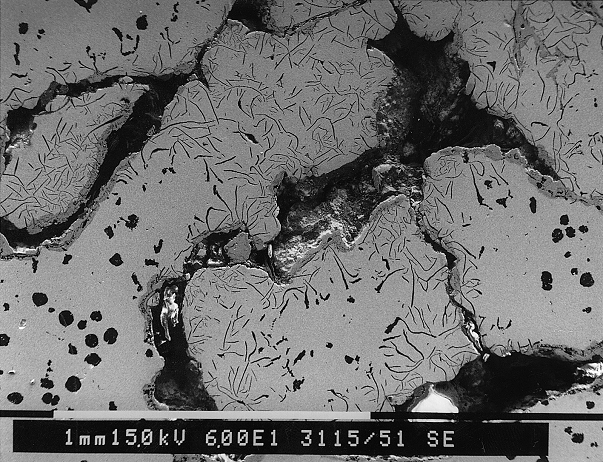 There are two types of metallurgical defects to watch out for. Cracks appear in the form of irregular crevices in a branched pattern. 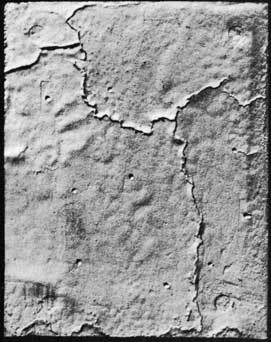 Some cracks are obvious and easily seen, while others can require magnification. 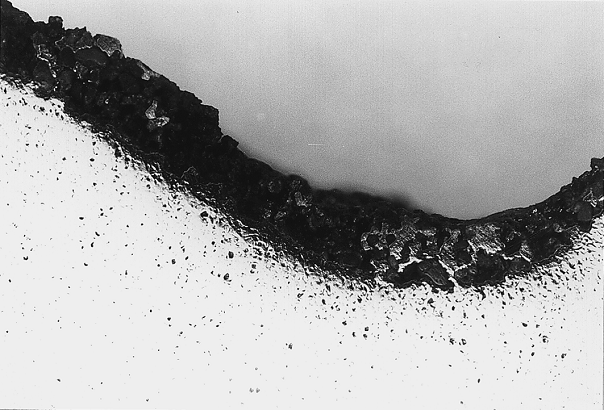 Cracks occur as the casting cools, towards the end of solidification. If the solidifying metal does not have sufficient strength to resist tensile forces during solidification, hot tears will appear. Hot tears are mostly caused by poor mold design. Modifying the mold to improve collapsibility can easily resolve these issues. Hot spots are spots that are harder than the surrounding area. This is because they cooled more quickly than the surrounding material. Hard spots can interfere with machining and increase tool wear. Cold shut is a type of surface defect. You’ll see a line or crack with a round edge on the casting surface. This defect is visible to the naked eye and often results in rejecting the cast, as it creates a weak spot. When molten metal enters the mold from two gates, the streams will meet at a junction. Low temperatures can prevent fusion at the junction, causing the streams to solidify before fusion, creating a cold shut. Cold shut is usually a result of a lack of fluidity of the molten metal, or a poor design of the gating system. 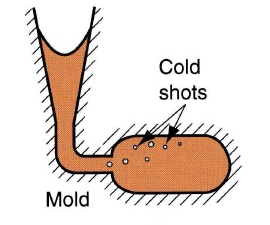 Misruns occur when the liquid metal is too cold to flow to the extremities of the mold cavity before freezing and solidifying. The liquid metal does not completely fill the mold cavity. 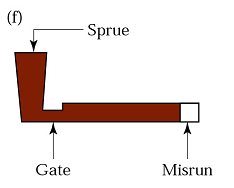 The misrun is the unfilled portion or space in the mold. Splattering during pouring of a liquid can cause solid globules to form. As these globules freeze, they become entrapped in the casting. Cold shots are typically ball, drop or pearl shaped and loosely attached to the metal. 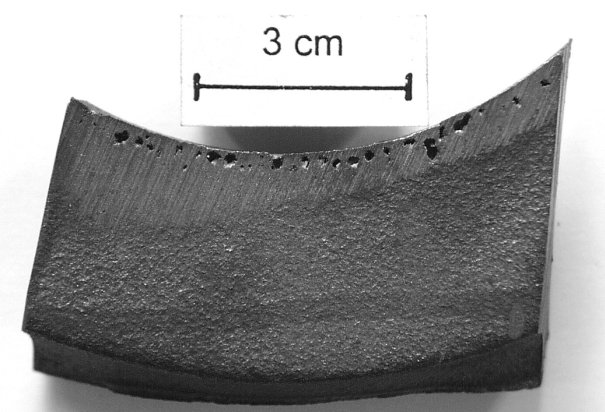 These irregular metallic crusts are found on the casting surface. Scabs are typically only a few millimeters thick but can be seen by the naked eye. They usually have sharp edges, irregular shapes and are firmly bonded to the casting. Scabs are closely related to rat tails and they usually appear together. Removal of scabs will typically reveal a rat tail underneath. Slag inclusion is caused when molten metal containing slag particles is poured into the mold cavities and solidifies. Preventing slag inclusion is a simple fix. Remove slag particles from the molten metal before pouring it into the mold cavity. Adding ingredients to the mixture to cause slag to float to the top where you can easily see and remove it before pouring. Or use a special ladle that pours metal from the bottom. These types of casting defects are related to the overall shape of the final casting. 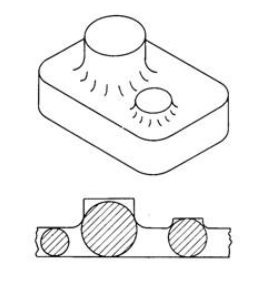 Mold shift is due to misalignment of upper (cope) and lower (drag) part of the mold. 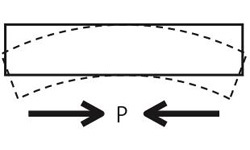 Mold shift is usually reflected as a horizontal displacement. Core shift is similar to mold shift, but it’s the core that is misaligned, not the mold. Core shift is usually reflected as a vertical displacement. If you’re experiencing shift, try checking the match plate pattern mounting and alignment. Make sure to use proper molding box and closing pins. Flash is one of the most frequently occurring casting defects and also a common injection molding defect. Flash, also known as casting fin or burrs, is any unwanted and excess material attached to a cast. It’s typically a thin sheet of metal that forms at the parting faces. Flash is a waste material that turns into dross after being re-melted. 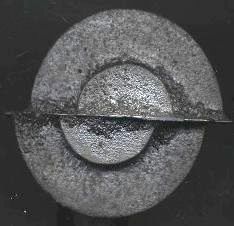 Flash on the casting surface is due to a crack or gap on the core surface. Insufficient weight on the mold or improper clamping of the flask can lead to a gap. Remedy this issue by reassembling the mold and cores. There should be enough weight on the top part of the mold so that the two parts fit together tightly. Flash can vary from minor to very serious. If it’s not too serious, manufacturers can remove flash by breaking it off with a hammer or pliers and filing it down to the parting line. However, this can be a costly process. Warping is an unwanted casting deformity that can occur over time, which results in a change in the dimensions of the final product.It can happen during or after solidification. Warping is typically a result of different rates of solidifications of different sections, which causes stress in adjoining walls. Large and flat sections are more prone to warping. Normalizing heat treatment can remove residual stress in iron casting. A straightening between quench and aging processes might also be required for aluminum casting. Knowledge of casting defects and causes is essential to managing casting quality.You should set clear defect tolerances and quality expectations with your suppliers before production to help them understand your quality standards. Defect tolerance can vary between products and types of casting defects. Determining your tolerance for these casting defects can help your supplier better understand your standards and prevent future misunderstandings and quality issues. Ultimately, the manufacturer must strictly control quality of each casting process. Experienced importers rely on quality control inspections to limit casting defects in their products before they leave the factory.